This article was published by the American Scholar. In six years of nearly continuous protests, this one was the most articulate. 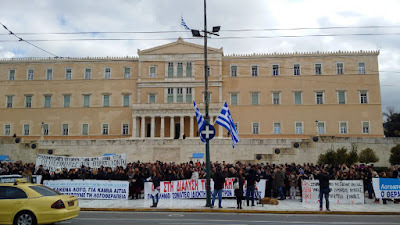 Some 400 speech therapists, occupational therapists, and child psychologists stood outside the Greek parliament in late January, calling on the government not to cut subsidies they receive from the national health system. The protesters—well-dressed, middle class, and highly educated, many of them at universities in the United Kingdom and the United States—were not the sort who generally take to the streets. And yet, so angry were they with the government that they marched out into traffic, led by a stray dog that had instinctively placed itself at the head of the column, and paraded their banners and slogans across the centre of town to the doors of the Ministry of Health. Given the makeup of the crowd, the elocution on Syntagma Square was unusually refined that day. “For no reason, for no cause do we demean speech therapy,” the protesters chanted in rhyming, scanning Greek. “There is no therapy for austerity,” read one banner. Ever since the 2010, when the first of 13 austerity packages aimed at reducing the budget deficit was approved, Athenians have grown accustomed to routine disruptions. At least on this day, the entire street wasn’t cordoned off, as happens every few days for larger demonstrations. Motorists simply weaved their way around. The Greek government pays for less than half of a child’s therapy costs, but that subsidy still means treatment for thousands of families. The health budget plummeted by €129 million this year and by 35 percent over the past eight years. The government has already shortened the list of medicines it subsidises, frozen the hiring of doctors and nurses in public hospitals, and allowed its debt to medical suppliers to rise to €1.8 billion. That it should now attempt to reduce welfare for children—at a time when the country’s birthrate has been declining for a decade, having slipped below the death rate four years ago—shows how desperate it is to find new areas of economy. Austerity was supposed to make Greece more efficient. In this case, it seems to be imperilling the country’s future. I was recently at a farmers’ protest in Korinth, an hour’s drive from Athens. About two dozen tractors and pickup trucks roared into the town’s central square with horns blaring. The lead tractor parted traffic and pedestrians with a two-tone foghorn. “The government needs to understand that we can’t go on—we’ll demolish everything,” threatened the farming cooperative’s leader, once the gathering had come to a standstill. He ceremoniously took a list of demands to the local prefect, astride his tractor like a centaur, as the other farmers cheered him on. The demonstration was pure street theatre, and in years past farmers did use the winter lull between reaping and sowing to extract a higher European Union farming subsidy out of the government. In the past two years, however, they have had cause for existential concern. Once fixed at six percent, their income tax will now rise from 22 to 45 percent. The EU has cut agricultural subsidies to Greece in order to divert money to the newest members from Eastern Europe, and the fuel subsidy was eliminated this year. Worst of all, the Greek government has passed a draconian social security law forcing all self-employed professionals, including farmers, to pay 27 percent of their income toward pensions and health coverage. The full force of these measures will hit farmers this year. Many know they will not survive, unable to set aside enough money to sow next year’s crop. Greek agriculture is worth €7 billion—some four percent of the nation’s economy—but its strategic value is far greater than that, with agriculture accounting for 23 percent of exports. Greece needs this vital foreign currency to repay its foreign debt of €330 billion. In addition, an estimated 700,000 people—one fifth of all Greeks who are employed—work in agriculture. Farmers were once a prized and pampered constituency: two decades ago they paid no social security. That they should be brazenly put upon shows how great is the pressure from Greece’s creditors—the International Monetary Fund and the rest of the Eurozone — to generate an ever-larger budget surplus. The Eurozone insists that for the next decade at least, 3.5 percent of GDP—about €6 billion—be set aside to repay debt. This debt repayment bill will be ruinous to the Greek economy, which has been stuck in recession for eight years and needs to finance growth and jobs, because it pushes taxes ever-higher. As it is, Greek tax revenues already represented 39 percent of the economy, according to Eurostat, the statistical agency of the European Commission. Under the new social security law, that figure could well soar beyond the EU average of 40 percent. The Greece I grew up in during the early 1970s was an American protégé surrounded by a thousand kilometres of Iron Curtain, and that precariousness very much defined the terms of its existence. There were no official visits to or from Warsaw Pact countries until the late 1970s. Although Greece joined the European Union in 1981, radio remained state-controlled until 1987, television until 1989. The communist party had been outlawed in 1949, when it lost its bid to seize power in a bloody civil war. Greeks abided by the political zoning laws of East and West, even if many disagreed with them. When Colonel Yiorgos Papadopoulos and a small group of officers suspended parliamentary democracy in 1967 to pre-empt what they saw as the surreptitious advance of communism, most Greeks acquiesced. With the fall of European communism in August 1990, Greece found itself in a world of bewildering opportunity. Cheap labor from Albania and Bulgaria poured across the border, willingly constituting an underclass of construction workers, fruit pickers, and domestic labourers. Banking deregulation liberated credit, enabling Greek investments to flow north. By the turn of the millennium, Greek banking, telecommunications, and supermarket subsidiaries could be found as far away as Poland. Rapid extensions of credit had taken place before in developed Western economies, but never in Greece. For the first time, the Greeks, who had learned to scrimp and save to build their homes, were able to borrow against ancestral farms to go on holiday. Dictatorship nostalgia was then a parochial phenomenon. That changed with the entry into parliament of the nationalist, far-right Golden Dawn party in 2012, which now commands a good seven percent of the vote. Whereas many Greeks saw the dictatorship as a Cold War tolerance—and the result of an excessive U.S. foreign policy—during the Great Recession they have often blamed democracy for the financial mismanagement that led to the country’s collapse. Some conservatives have hankered for the command economy of the dictatorship, which invested massively in construction and network industries, extending roads and copper wire to much of the country. Under the colonels, Greece did experience annual growth of between five and 10 percent, a 16-fold rise in exports, and unemployment as low as two percent, but it also saw widening income inequality, rapid growth of government spending, and high overseas borrowing. In other words, the economy grew without necessarily becoming more competitive—trends that democratic governments would later accelerate rather than correct. Nostalgia always invents its object on the basis of a truth. The inaccurate conflation of dictatorship and economic soundness in the minds of many Greeks suggested its own false antipode—a conflation of democracy and economic irresponsibility. After populist leftism stormed to power in 1981 in the form of the socialist party Pasok, this spendthrift view of the left would be reinforced. Pasok prided itself on bringing a social revolution, and some of its changes were indeed revolutionary. It completed the process of equalising the legal status of men and women, begun under the conservatives. Civil marriage and divorce took legal precedence over religious ceremony. The construction of a new wave of European Union–funded university hospitals, freeways, and infrastructure commenced across Greece. With their police files incinerated, communists ceased to be afraid of surveillance and discrimination for the first time since the civil war. Even more important, the communist National Liberation Army, which fought against the Nazis, was officially reinstated after years of being omitted from an annual remembrance of the resistance, helping to heal the divisions of the Civil War of 1946-49. However, Pasok also became known for corruption and client politics. It nationalised faltering or stagnant companies to prevent mass layoffs, but instead of turning them around, it bloated their payrolls with political supporters and sank them deeper into debt. (Olympic Airways was a classic example. By the time the airline was finally privatised in 2009, it was costing taxpayers €1 million a day.) Just before the financial crisis of 2008, Greece’s leading labor think tank estimated the public payroll at more than a million people: almost one in four employed Greeks, that is, worked for the government. Not only did Pasok increase public spending from 38 percent of GDP to 48 percent during its eight years in power, it also did so in a vindictively partisan manner, tirelessly politicising public bodies and eradicating neutrality. Agricultural cooperatives abandoned their duty to sell produce as competitively as possible, instead funnelling EU subsidies to the party faithful. Pasok unionists lobbied for ever-more benefits and earlier retirement from public service. Greek communists who had gone into exile in the Soviet Union were invited back with free retirement benefits at the expense of the merchant marine fund. Shipping is an age-old enterprise in this maritime nation, but now, its retirement fund promptly went from financial health to dependence on state support. By the time conservatives came to power in 1990, the tradition of partisan favouritism was entrenched. The result is that even after six years of unsparing austerity, almost 70 percent of tax revenue is still spent on the public payroll and topping up bankrupt pension funds. Despite the political cost of the financial crisis, which has reduced the life expectancy of governments to an average of 17 months, Greek parties still haven’t replaced the cynical calculation that bankrupted the country: it is easier to win elections by promising handouts to 2.7 million pensioners and 650,000 public employees than by promising competitiveness to the three million workers left in the private sector. Governments are able to get away with this because, by and large, Greeks don’t trust capitalism to deliver social benefits. Does this mean the Greeks have had more democracy than they can responsibly wield? Do they need a new period of oligarchy to set things right? The short answer is that the colonels who imposed a military junta on the country in 1967 can hardly be said to have instilled political maturity, so it is difficult to justify the medicine a second time. The longer answer is that Greek democratic sovereignty has dwindled throughout the crisis as Greece’s creditors—the International Monetary Fund and the rest of the Eurozone—have held a power of veto over budgetary decisions. The resulting policy mix extinguished an enormous deficit and balanced the budget, but it did so on the back of a social disaster: Greece lost a quarter of its economy—five times more than it lost in the Great Depression of 1929–39. The IMF at least had the decency to admit, in 2013, that it had misjudged the effect of abruptly cutting public spending without a growth program and social safety net. The Eurozone, led by Germany, has been unrepentant. Greece’s treatment by its European partners, in particular, has been shocking, partly because relations within the European family were supposed to be collegial, not adversarial, and partly because Eurozone leaders took the view that the Greeks could not afford democracy until they paid their debts. Austerity bills hundreds and sometimes thousands of pages long would be sent to parliament with only a few days for ingestion and debate. Two moments, in particular, demonstrate the contempt in which other Europeans held Greek democracy. In 2011, after he announced he would hold a referendum on Eurozone membership, Prime Minister George Papandreou was browbeaten by French President Nicolas Sarkozy and German Chancellor Angela Merkel into resigning. Papandreou appointed in his place Loukas Papademos, a former central banker, who had Germany’s backing. It was Papademos who passed the most controversial measure of the recession—lowering monthly minimum wages from €731 to €586—leading to the most destructive anti-austerity riots Athens has seen before or since. The second—and darker—moment came in 2015. In January of that year, the Coalition of the Radical Left, known as Syriza, became the largest part in parliament, with its chairman, Alexis Tsipras, taking over as the country’s prime minister. Six months into its mandate, the Syriza government failed to convince the rest of the Eurozone to reschedule Greece’s debt. Syriza not only spent every penny in the treasury, it also defaulted on the IMF at the end of June. This was the credit event that the bailouts had sought to prevent since 2010, yet the markets barely took notice: to the rest of the Eurozone, Greece was barely even a nuisance anymore. To say that the Greek experience accelerated Brexit and a return to nationalism within the European Union in such places as Hungary and Poland, is not an exaggeration. If sovereigns are to be treated no differently than any other debtor (and possibly worse), if the Eurozone provides no protection from markets, if the EU has decided to rip up its Social Charter and cannot augment democracy or the feeling of security, then what point the EU? Greece’s treatment, far more than Ireland’s, Portugal’s or Spain’s, has demonstrated the impotence and internal asymmetry of the Union. Cementing the democratic polity as the best guarantor of stability, irrespective of whether the government has right or left leanings, is Greece’s great intangible benefit of the last four decades. It is better to be disappointed by your choice of leadership than to feel you had no choice. But democracy is not always lost in one fell swoop. It can be eroded, and when this happens, people begin to realise what is at stake. In Greece’s case, the response has at least been to preserve the parliamentary process, and hope it will one day better represent what people actually want. But the political class is unmistakably walking in the wilderness. Many members of parliament are wary of meeting with constituents. They still have a chance to redeem themselves. If the present were to be viewed as the distant past, the Great Recession might yet be a period in which Europe committed shameful errors, but Greece overcame its own.